The concept of one’s forest haven becoming a wilderness classroom is a key principle of any traditional black powder hunt. In many instances, the historical record lacks a clear and decisive step-by-step listing of daily life activities. If a hunter hero’s memoirs contained such trivia there would be no space left for the harrowing adventures that attract us to a given individual’s narrative. And I suspect that if such a how-to existed, living history as a pastime would have run its course long ago. For a veteran living historian, the creation of a new persona is fraught with obstacles, and depending on the complexity of the characterization, perhaps more so than the path of the novice who is unaware of the intricacies of creating an alter ego. As I have stated before, it turned out undertaking a returned captive persona involves a heap of research and is more complicated than I originally thought. The challenge alone is worth the effort. Perhaps the greatest challenge is a cultural change in perspective. The returned native captive is, in many ways, the antithesis of my sometimes trader/sometimes post hunter persona. There are similarities, of course, especially with respect to hunting techniques. 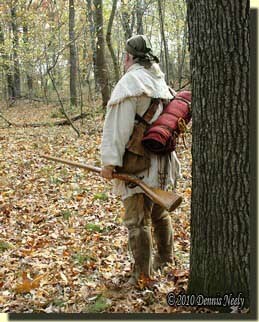 The simplicity of the clothing and accoutrements, the austerity of a feast-or-famine daily life and a keen knowledge of and dependence on the wilderness environment, clearly call for a back to basics approach—I think more so than a characterization based on a European cultural background. Jonathan Alder or John Tanner thought nothing of walking, paddling a canoe or riding on horseback into the 18th-century forest and living indefinitely, comfortable and content with great hardship. Both Tanner and Alder were pretty skimpy when it came to describing their personal accoutrements. Neither mentions a “split pouch,” as the belt bags that fold over ones sash or belt are called. After studying the written words of returned native captives, like Tanner, Alder Smith and others, my research turned to known artifacts and period drawings or paintings. Although Sir John Caldwell was never a captive, he was an officer in the King’s Eighth Regiment of Foot at Fort Detroit from 1774 to 1780. From all accounts, Caldwell spent a fair amount of time among the Ojibwe, who made him a chief. His artifact collection is relevant to my characterization, because it is close in time period, shares the same general geographical region and reflects the cultural influence of the Ojibwe people. A couple of years ago, on a traditional black powder hunt near Marl Lake in Michigan’s Lower Peninsula, John Booy carried a reproduction of a split pouch based on an original often referred to as the “Deerfield Pouch” or the “William’s Pouch.” The Deerfield pouch is from the 18th century, but it has a more eastern influence as it belonged to Arosen, Eunice Williams’ Mohawk husband. The National Museum of the American Indian houses a collection of artifacts gathered by Major Andrew Foster. Again, Foster was a British officer assigned to Fort Miami and Fort Michilimackinac from 1790 to 1795. Like Sir John Caldwell, Foster collected Great Lakes Indian material culture, which includes a quill-worked split pouch. The NMAI assembled some of Foster’ clothing and accoutrements for an exhibition, and displayed them on a mannequin to give them a better visual context. The split pouch is hung from an exquisite finger-woven sash on the mannequin’s left side. Based on my research to date, I decided to construct a split pouch similar to the Foster example. 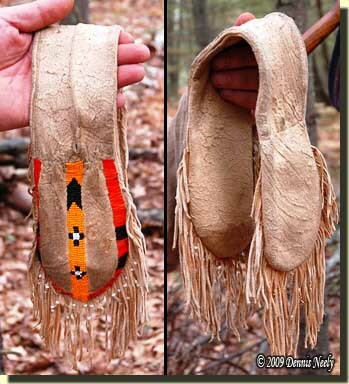 For my new persona, I wanted to hold to the back-to-basics approach with a simple, utilitarian pouch that reflected the Ojibwe cultural influence, yet was durable enough to withstand the abuse of heavy brush hunting. And having no woodland experience with using a split pouch, I look forward to future lessons in the wilderness classroom, which I expect will be fruitful and perhaps a bit surprising.